After rumors detailed the downward spiral of the toys-to-life experience, it is now confirmed that Lego Dimensions is done for. Just last week we reported on the all-but-confirmed rumblings from anonymous sources that the ultimate cross-over toys-to-life property Lego Dimensions would be shut down a year before TT Games and Warner Bros intended. 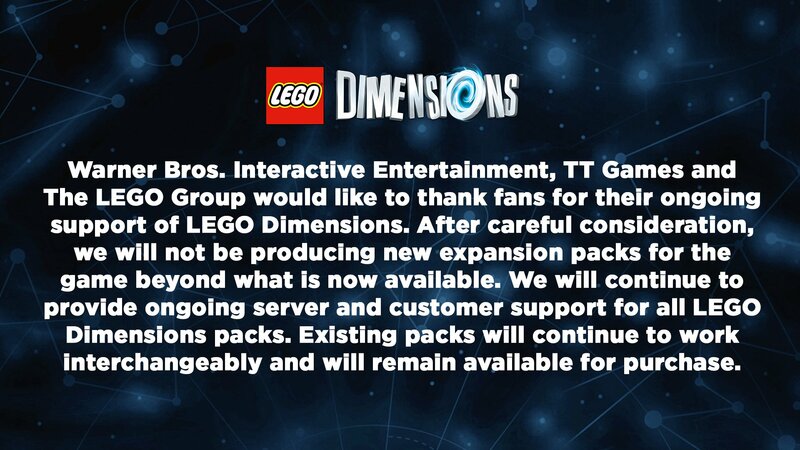 Then, there was no official word confirming the rumors but that changed today: Warner Bros. Interactive Entertainment, TT Games, and The Lego Group are ending Lego Dimensions. The image above was shared from the official Lego Dimensions Twitter account and is essentially a death-knell for toys-to-life genre. The Amiibo from Nintendo will likely thrive on the strength of the company for the long haul, but new toys-to-life initiatives are not likely. What say you? Do you mourn the loss of Lego Dimensions, Disney Infinity, and the like? Well hopefully I can grab a bunch of packs on sale that'll keep Jr interested for a while. But it's sad.